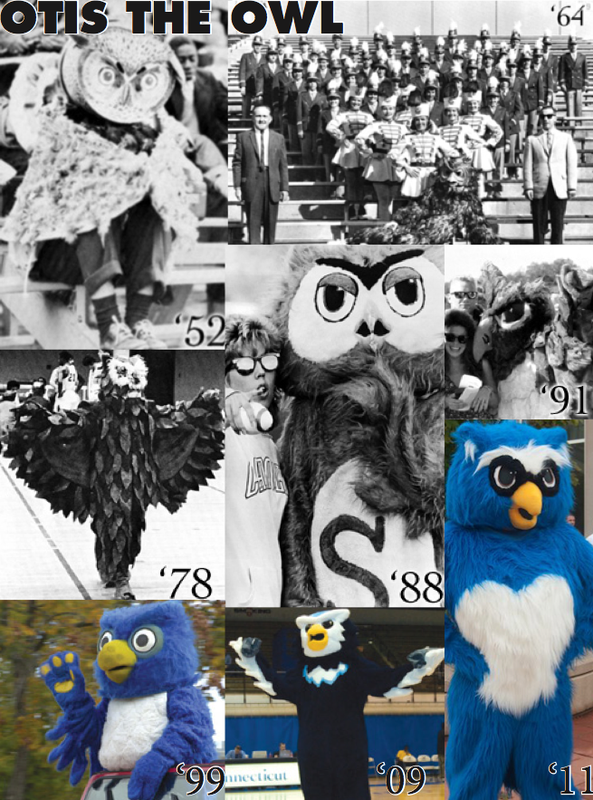 The owl mascot soon became a beloved presence at games and other events, with a dedicated fan decked out as Southern’s ultimate fine-feathered friend. In step with the ongoing evolution of the university, the mascot has had its fair share of major makeovers during the last 58 years. A new costume was developed for the 2006-07 academic year, in conjunction with the adoption of a new athletics logo, according to Michael Kobylanski, associate director of athletics/communications. Today, Southern students, including many student athletes, portray the Owl on a rotating basis. Among them was May graduate Gary Pope, ’09, a liberal studies major and member of the track and field team, who played the Owl at games and other events, including Girls and Women in Sport Day in January. Circa 1952: Take one set of wings and a painted hat-box. Voila! Meet the New Haven State Teachers College owl. 1964: The owl strikes a relaxed pose during the early Beatles era. 1978: Spreading his fabric wings at a basketball game. 1988: The owl lost his feathers, but gained a fine suit of faux fur. 1991: Big beak equaled big attitude as the owl adopted a more aggressive look. 1999: Soft and cuddly again ruled the day. 2008: The friendly raptor was a big hit on Bring Your Child to Work Day. 2009: The contemporary owl mixes and mingles.